Creamy organic coconut oil is first infused with organic comfrey and arnica, then expertly blended with our top-selling Muscle Menderâ„¢ blend of essential oils traditionally used to help ease minor muscular aches, bruises or pains, first made popular by our original Spa Salts of the same name. 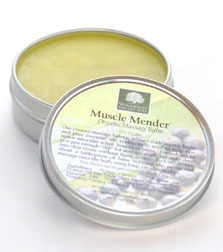 Formulated to give just enough â€œslipâ€ for massage and body work, but sinks deep into skin tissue without being greasy. Ingredients: *Organic Virgin Coconut Oil, *Organic Sesame Oil, *Organic Castor Oil, *Organic Shea Butter, *Organic Beeswax; Pure Essential Oils, White Camphor Oil, Menthol, *Organic Comfrey, *Organic Arnica, Vitamin E. (*Certified Organic) 3 fl. oz. Slip Cover Tin. I run marathons and after a race in Arizona a few years ago, went to the hotel spa for a sports massage and they used this product. It relieved my aching muscles IMMEDIATELY! I bought some from the spa and then was so excited to find it locally. Now, I can't live without my Mender!